rtoria was a tattoo attraction that worked for 35 years in circus and carnival sideshows, including the Ringling, Barnum & Bailey Brothers Circus (from 1921 to 1923), the Hagenbeck-Wallace in 1924 and others. 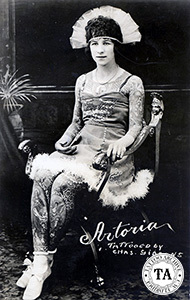 Artoria was the stage name for Mrs. C. W. (Red) Gibbons. Artoria was born on a farm in upper Wisconsin. Her parents were poor and by the age of 14 she decided to leave home. When she was interviewed by Arthur Lewis, writer and author of the book, Carnival, she said, "I never been no place in my life." While hanging around a local carnival sideshow she met Red Gibbons. "Him and me got to talking, tole me the show didn't have no tattooed lady and would I like to be one." Said he was the tattoo artist and if I let him tattoo me I could join the show and see the world. Well that's what I done. We was married soon after that and we both had a good life. There ain't hardly no place in the country I ain't been to but when he died (late 1940's) I went into retirement out on the west coast." In the 1950s Artoria came out of retirement and worked with the Dell-Travers ten-in-one show: " Last year I saw Mr. Potter's advertisement in "Billboard." I applied for the job and here I am folks, to show you the most amazing tattoo in the world, covering more than eighty percent of my entire body." Artoria's tattoos were amazing: magnificent reproductions of paintings by Raphael and Michelangelo and a few patriotic designs but for those few exceptions the main inspiration is Italian. "My husband done everyone of them," she said proudly. "They're all masterpieces. He was crazy 'bout eyetalian (sic) painters." Little has been written on the lives and careers of many tattooists and tattooed attractions of the past. Some of them have gone so far as to write their autobiographies, but these are few and far-between. Others have been interviewed for magazines and newspaper articles giving us some insight into their lives. Unfortunately, and more often than not, the writers of these articles have their own agendas. They embellish their stories, perhaps to sell more books, which results in a distorted history. Sometimes all we can do is to take tidbits of available information and try shaping it into a picture of what these tattooed folks were really like. This distortion is not unique to tattoo history. It shows up in much historical writing making it all the more important for historians to get the record straight. I was recently contacted by Charlene Anne Gibbons, who was doing family research on her tattooed parents, Artoria and Charles "Red" Gibbons. She had stumbled onto the Tattoo Archive's website and took exception to the biographical information on her mother in our history section. She thought that the portrayal of her mother's speech, as quoted from the book Carnival by Arthur Lewis, was degrading. Contrary to what was written, she said that Artoria never left home at the age of 14 and that her parents had been married for 4 or 5 years before Artoria began getting tattooed by her father. Charles "Red" Gibbons was one of the best tattooists of his generation. There is no better example of his skill than his beautiful wife Anne (who used the stage name Artoria). Carrying on in the grand tradition that goes back to the 1800's, a tattooist would tattoo his wife thus making her his calling card for his tattooing ability. The tattoo art on Artoria's body was so beautiful and she was such a looker that I'm certain she often stole the spotlight from her tattooist husband. Charlene also told me that due to getting beat up during a brutal robbery on his way home from work in 1941 and a construction accident in 1946, Red became totally blind. Red Gibbons died on June 18, 1964. 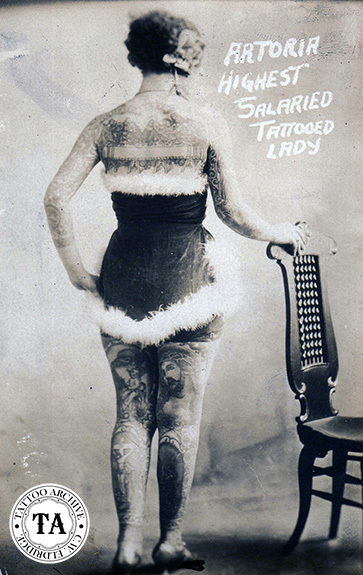 Artoria was in retirement when she saw a Billboard advertisement seeking a tattooed lady for the Dell-Travers Ten–In-One Show. She got the job and spent several more years on the road, later working for Ward Hall. Artoria died on March 18, 1985. Her daughter Charlene is now in the process of writing a book about her famous parents and hopes to set the record straight. Charlene said,"I am writing the book myself. It is about my extraordinary parents, their lives, and the people they came into contact with along the way. It is a tribute to the 'finest in tattooing' and show-business life. I understand from what I have read, not much is known about my parents, what seems to be known has not been written by 'personal knowledge' at all. It has all been speculation, gossip, and innuendo, and does not do justice to either of my parents." The tattoo world will sure be looking forward to that book!